Police say dem use small force take pursue two political parties we yenta road protest election mata on Friday morning for Port Harcourt. Tori be say Rivers State government last night ban all forms public protests until further notice. Why e hard for Rivers to do election wey no dey get k-leg? Police tell BBC Pidgin say as dem notice say jaguda pipo fit hijack di protest ontop di suspended govnorship and house of assembly election, dem decide purse di pipo wey gada for polo club. "My pipo (police men) say dem tok to di protesters and dem leave peacefully, and e possible say dem use tear gas for those wey no gree listen," Nnamdi Omoni, di Police tok-tok pesin for Rivers State command tok. 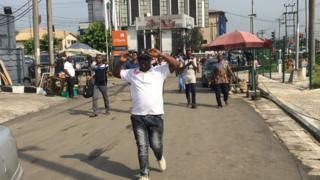 "We just get di report say Rivers State gomenet place ontop protest, but I no fit comment on top di ban and I believe say di Police Commissioner go discuss dis ban at strategic level wit di Govnor (Nyesom Wike)"
Di state spokesperson, Emma Okah announce di goment decision on Thursday, say all security agencies don collect directive to enforce di order. Meanwhile, main opposition PDP dey para say jaguda pipo wan cause confusion for Rivers State wia dem believe say na di party dey win di Govnorship election. Nigeria election offic INEC bin suspend di 9 March election for Rivers State sake of wetin dem say be violence and gbege dem wey happun as di election happun. Since wey INEC suspend na so so protest upon protests by different groups dey happun for Rivers State, southern Nigeria. Nigeria election office on Thursday 21 March announce say dem go use one more month to torchlight and conclude Rivers State govnorship and House of Assembly election results. 25 to 31 March, INEC go revalidate electoral officers, meaning dem go torchlight & re-register INEC workers. 13 April, INEC go conduct extra (supplementary) election for places wia di 9 March election no happun. 13- 15 April INEC go announce all results wey concern Rivers State govnorship and House of Assembly election. 19 April, INEC go give Certificate of Return to winners. Rivers State: Why e hard to do election wey no dey get k-leg?